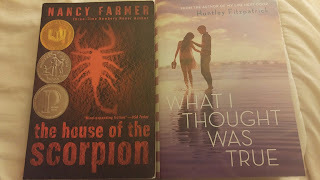 I LOVED The House of the Scorpion! Enjoy your books this week!! Awesome haul. House of the Scorpion looks amazing. Not read either of those so I hope you enjoy them! Excellent! Hopefully you enjoy your new books, darling! I found The House of the Scorpion for $.50 a few weeks ago at a local cafe. Hope we both enjoy it!